Place farro in a medium pot and add 3 cups of water and a pinch of salt. Cover, bring to a boil, turn heat down to low and simmer for 40 minutes. While farro is cooking, heat a large heavy-bottomed pan over medium high heat. Add the oil and onion, stir and cook for 1 minute. Add the potatoes, garlic, curry and sugar, stir and cook for 1 minute. Add the lime leaves, coconut milk, and squash, stir and add enough water to just cover the vegetables (about 1 cup). Cover and bring to a simmer, then reduce heat and simmer until vegetables are almost tender, about 20 minutes. Drain the farro over a bowl (to save the liquid). Add farro, garbanzo beans, fish sauce and salt to the curry. Add farro cooking water to curry until it reaches your desired consistency. Cover and simmer for another 10 minutes. Uncover, remove lime leaves, and add rice vinegar. 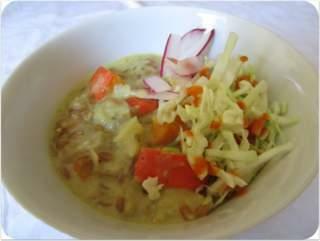 Serve alongside bowls of toppings such as fresh shredded vegetables, shredded coconut, lime wedges and roasted peanuts. Pass the hot sauce and Enjoy!